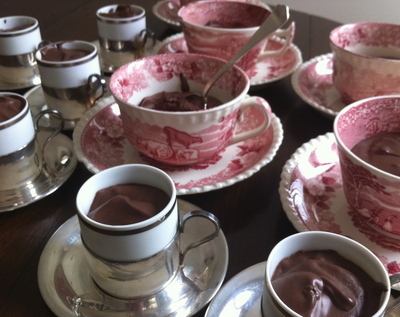 As always on the lookout for a recipe that will use a lot of eggs, I dug out my grandmother's chocolate mousse recipe. Ten eggs later, it is as decadent as I remember - an easy and delectable treat for you and your guests. Unlike the plethora of chocolate mousse recipes: from Julia Child to my backyard egg mainstay book, "Eggs" by Michel Roux, this recipe does not call for any sort of dairy or butter. In fact, aside from the eggs, one could consider this vegan. The recipe is easy and fast. The end result is scrumptious. Imagine eating a luxury dark chocolate bar with a spoon, like it is ice cream. I procured my baking chocolate from Mindo Chocolates, our bean to bar business in Dexter. The 10 eggs were from our backyard chickens. Water, sugar and vanilla round out the ingredients. Melt together (in a double boiler) the chocolate, sugar and water. Stir. When smooth, cool, stirring occasionally. Add well-beaten yolks and vanilla. Beat egg whites until able to hold peaks. Fold egg whites into chocolate mixture. Put in a deep crock or individual serving dishes. Refrigerate at least 12 hours. This is what I learned from doing the recipe. Instead of using a double boiler to melt the chocolate, water and sugar - I used a metal bowl on top of a pot. That worked just as well and was much more economical than purchasing a double boiler. The chocolate is the consistency of icing when you add the egg yolks; there is no need to add extra water to make it creamy. I also learned that egg whites treble in volume when beaten, ending up on the floor. Next time I will use a larger bowl from the outset. As for serving 6 to 8, I cannot imagine wanting to have more than ½ cup of this rich chocolate immersion after a full meal. I divided mine into 10 teacups and six espresso cups (making 16 servings) and refrigerated for 36 hours. I removed the cups from the refrigerator two hours before serving to bring out the flavors. For those at your table who want something lighter and less intense, I would recommend offering at bowl of whipped cream and perhaps some berry jams. Everyone likes making his or her own dessert, and the chocolate mousse is sturdy enough to be the bass note of whatever dessert compilation is orchestrated.